Labuh sesaji is one of the annual events that held in Sarangan Lake. It is performed in ruwah month, Friday pon (Javanese date). 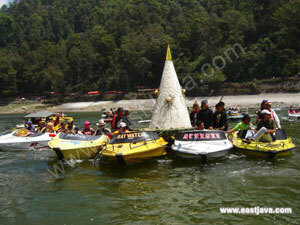 It is ‘Bersih Desa’ (Clean Village) event marked with Labuh "Sesaji" to Sarangan Lake. It is the thankful expression from public to the one supreme God because the present of Sarangan Lake, so that it give the prosperity for Magetan public and Indonesian. So many ways are being used by the local government to celebrate the new year of Hijriah. At Jogjakarta there is Sekaten, at Solo (Mid Java) there is Grebeg Syuro because it coincidently come with the change of Java’s year which starting from Suro. Any other places like Sukabumi (West Java) is also celebrate this Islamic new year by doing Larung. Different with other places, in Magetan East Java, in order to attract the visitors to come, they make “Ledhug”. Lesung Suro and Bedug Muharam (Ledhug) is drum on continually and it is been combined by the sound of gong and many more instruments then make a uniqueness traditional music. Before the process of Ledhug is begin, there is a “Prosesi Andum Berkah Bolu Rahayu”, which is the most attractive one. Thousand of societies are gathering in front of town square, struggling to take the Bolu or the bread. Before it goes on procession to go to town square, the bread is on ritual offering, because it believe that it has grace for those who eat it. Moreover, there is Jarak lawu traditional dancing which brought by the elementary students and also Magetan traditional transportation called Delman is being ride in the middle of the crowd. When the sound of Gamelan, traditional music, is presented, the Major of Magetan and other local government is taking the Bolu and welcome flower by Dyah-Bagus magetan (it is like Miss Magetan). The Bolu bread is been modified as a mortar (Lesung), Bedhug and Gong then it is spread out to the people. Lesung suro is having purpose to celebrate the year of Saka, which starting on 1st Suro. As mention, Lesung or Mortar is a tool for pounding the rise and the object to communicate with the ancestors. Bedhug Muharram is having purpose to celebrate the new year of Hijriyah, which starting on 1st Muharram. Anyway, Bedhug for Moslem is a media for calling the people to pray to God, and Gong is Magetan industrial product, that already becomes an Exported product. 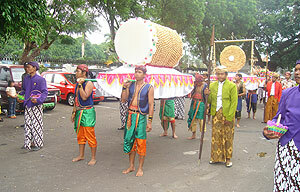 Judang is a traditional equipment to carry the ‘Uborampe’from Magetan society, which want to celebrate the marriage. The main purpose for those celebration is about to dig, to cultivate and to promote magetan traditional and industrial field, in order to develop Magetan as a Tourism Object and Tourism Destination Object.